I've been making the NYTs No-Knead Bread regularly, and this is the first time it happened - a sink hole. 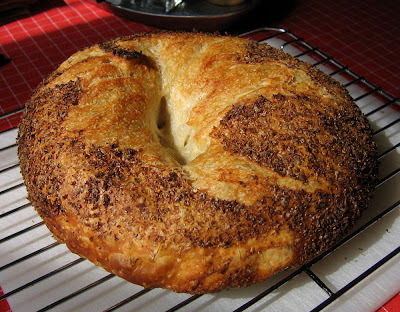 Really, it's not a bagel. It's a full loaf that didn't rise in the middle. I think I know what happened. Spring has arrived with 80-plus degree temperatures. Instead of an overnight rest at 67 degrees, this loaf spent about 20 hours in the high 70s/low 80s. I suspect the yeast overpopulated their environment - exhausting starch resources then dying from starvation. I reinvigorated the outside by turning it with flour before letting it rise a second time. But not kneading meant not getting the new starch infusion spread throughout. And it's very good. 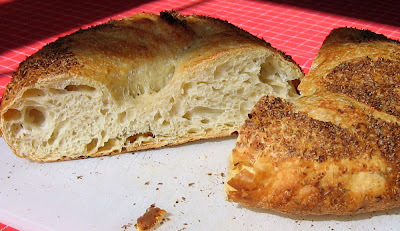 Chewy, crusty, tasty ... everything you could want in a bread, except whole grains. What can I say, a good loaf is my weakness. That's actually a nice looking loaf. It looks like some exotic bread shape that you did intentionally. "Bialoaf" or something. What's the topping you have on your bread? I think the topping is wheat bran. I used it to coat a towel that the dough sits on as it rises, so it doesn't stick. It has been years since I made this bread. I think it's time I tried it again.